The first product in this series is billed as "the world's first smart adaptor for attaching Canon EF lenses to the Sony NEX's E-mount". It enables full electronic control of the Canon lens aperture on the Sony NEX camera. Shooting data, such as focal length and aperture, is said to be transferred to the EXIF data, while manual and autoexposure modes are all available. Image stabilisation, both on third-party lenses and Canon IS lenses, is also supported, since it's the battery in the Sony camera that provides the power for this function. As with many third-party NEX adaptors, this Smart Adaptor isn't so intelligent when it comes to autofocus – it's manual focus only. The development teams have only tested the adaptor's compatibility with the Sony NEX-3, NEX-5 and NEX-VG10E camcorder, too. The Canon EF lens to Sony NEX Smart Adaptor features a Wide Open (WO) button that, once pressed, opens up the aperture to its widest setting. The default setting is for the lens to be stopped down to the shooting aperture in order to give an accurate measure of depth of field during live view shooting, although this can potentially make manual focusing harder. The new adaptor costs $399 and can be ordered directly from Conurus. 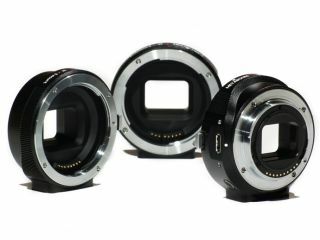 http://conurus.com/sony Nikon, Sony A mount and Micro Four Thirds Smart Adaptors are expected to follow.